(Bloomberg Opinion) -- Sometimes being good enough just isn’t enough. That’s the situation Deutsche Bank AG’s Asian employees may find themselves in if a merger with Commerzbank AG goes ahead. Deutsche Bank has relatively resilient investment- and corporate-banking franchises in the region, where Commerzbank has only a tiny presence. But the optics are awkward: It’s a unit stuffed with highly paid bankers at a time when the combination of Germany’s two largest listed lenders threatens as many as 30,000 jobs globally. The lack of a retail banking operation for Deutsche (outside India, where it has branches in 16 cities) or Commerzbank translates into a higher cost base. That’s likely to render Asia a target for cuts. Almost 50 investment bankers left Deutsche Bank in its regional hubs of Hong Kong and Singapore last year, or about 30 percent of the workforce before the departures, Cathy Chan of Bloomberg News reported in December. They have largely been replaced by junior staff. The bank had 19,700 employees in Asia (more than 10,000 of them support staff) at the end of 2018, out of 92,000 globally. That number was down from 20,700 a year earlier. The exodus has eroded its strength in investment banking. Deutsche Bank fell to sixth in the rankings for investment-banking revenue last year, trailing Citigroup Inc. and HSBC Holdings Plc, according to Coalition Development Ltd., a London-based analytics company. The German bank was fifth in 2017 and number one as recently as 2015. Deutsche Bank has also slipped in fixed-income, currencies and commodities trading, or FICC, though it remains well placed to deal with Asia’s bonds boom this year. 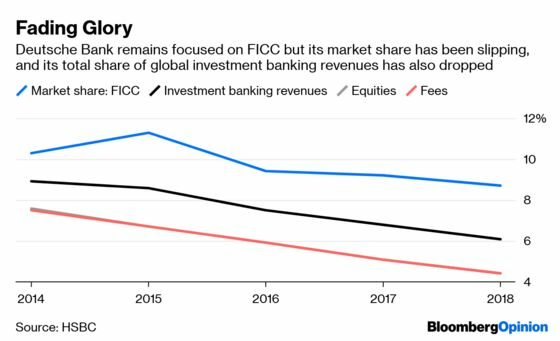 The lender also ranks third in FICC, after Citigroup and JPMorgan Chase & Co. Deutsche Bank’s Asian business, which made up 14 percent of global revenue in 2017, is doing better than its embattled U.S. investment-banking operations. The bank ranks a distant eighth in the U.S. and was downgraded by the Federal Reserve in 2017 to “troubled condition,” a rare designation that has constrained its risk-taking, according to the Wall Street Journal. Asia is a relative bright spot for the FICC business, which is in secular decline in other parts of the world. As we’ve written, China and India are widening access for foreign investors while the region’s comparative lack of automation is a bonus for banks. China’s inclusion in international bond indexes is raising fund flows that are an opportunity for German banks’ foreign-exchange trading desks. Transaction banking, wealth management, and corporate finance are also doing well, chalking up “double digit” revenue gains last year, according to a Deutsche Bank spokeswoman. The bank was an underwriter on the $23.6 billion IPO of SoftBank Group Corp.’s telecom arm in Japan last year and also helped arrange a $14 billion private fundraising by Ant Financial. It also advised MBK Partners Ltd. on its purchase of the Asia-Pacific retail and distribution licenses for the Godiva chocolate brand. If Germany is serious about creating a national financial champion that can help the country’s export-oriented economy emerge from its struggle, then investment-banking franchises that cater to China, the country’s most important trading partner, should be key. The chances of a Deutsche Bank-Commerzbank deal have dwindled in the past two weeks amid opposition from employees, unions and some major shareholders, Steven Arons, Jan-Henrik Förster and Ruth David of Bloomberg News reported this week, citing people close to the talks. Still, if the combination does happen, it’s hard to see how Asia can escape the knife. More cuts are coming in the U.S., which accounts for about 33 percent of Deutsche Bank’s global corporate and investment-banking revenue, according to HSBC. Because a big portion of Asian fixed-income, currencies and equities trading services U.S. clients, a reduced presence there will have a knock-on effect. Net revenue at Deutsche’s corporate and investment bank declined 8 percent last year, and the U.S. equities business is losing money. It’s going to be tough for Deutsche Bank to justify its size anywhere in this environment. In a sign of the times, the lender is weighing giving up as many as three of the 10 floors it occupies in its Hong Kong headquarters, Bloomberg reported last week. 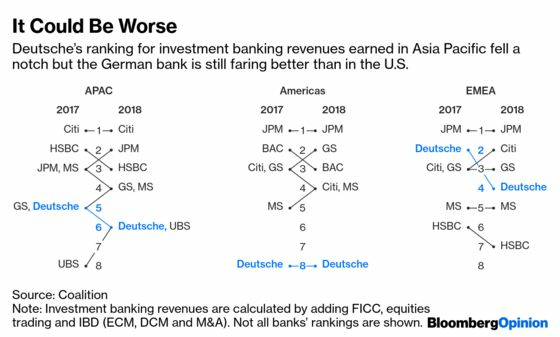 Asia may be small in Deutsche Bank’s world. Prepare for it to be smaller.